It’s been relatively quite around the action camera market leader GoPro since it launched the incredibly popular Hero 4 black and silver about a year ago. GoPro Hero 5 Blackis the new, redesigned model with image stabilisation and voice control and a bunch of other cool features that is poised to cement its leadership. Image source: GoPro. GoPro Hero 5 Black front view. 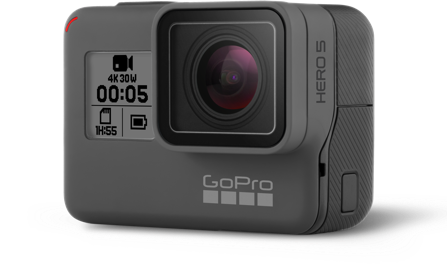 Similar to Hero 4 Black, GoPro Hero 5 Black also records in 4K format with 30 frames per second (fps). This is the only recording format supported, unlike the predecessors. Hence, there’s no need to choose between different speeds and types anymore in Hero5. GoPro Hero 5 Black is a very robust action camera that’s waterproof down til ten-metre depth water pressure. Previous versions like Hero 4 Black requires a bulky plastic shell to protect the camera under water, something that Hero5 doesn’t since it’s waterproof. However, Hero 5 still isn’t scratch resistant and properly protecting the lens is crucial, so a shell might still be a good idea for users that use the camera in a rough environment. GoPro Hero 5 Black comes with built-in voice control, which enables users to start and stop recordings. For example, the voice command “GoPro start recording” launches a recording hands-free. In addition, records can be tagged by a simple voice command. There are several other voice commands available that extend the way users integrate with the camera. All recorded material can be streamed to the cloud using a cloud service. GoPro Hero 5 Black will go on sale the October 2nd in New Zealand at a price of $639.99. The related camera Hero 5 Session costs $509.99. The SD card for Session costs an additional $49.